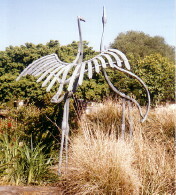 Crane Art 1 has a selection of external sites with crane culture, art and music. Please contact us to suggest more crane-related sites or report broken links. Art 2» presents a gallery of crane art in doors, furniture and even streetlights in Yunnan, China while Art 3» presents cranes in Australian logos and signs. If you have a commercial project, or grant funding, please support the people who've allowed us to use their photographs and artwork, details in Ozcranes About/Contact page. 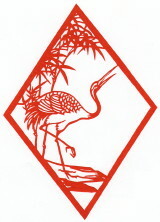 Explore image databases with cranes at the The Oriental Bird Club, RSPB, and International Crane Foundation. What is it with cranes and pine trees? 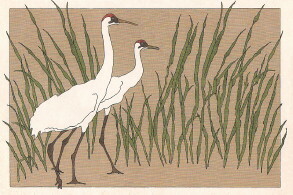 Cranes have featured in art for thousands of years in many cultures, symbolising long life and fidelity. 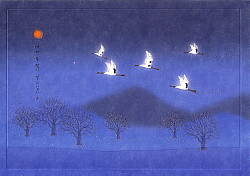 In Chinese, Japanese and Korean art cranes are often depicted with other symbols of long life, especially pine trees. 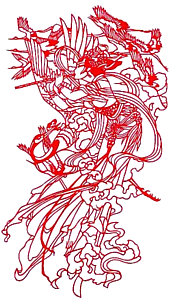 Not seeing, who remains to embrace their ancestors' vision of a Crane in a Pine Tree? 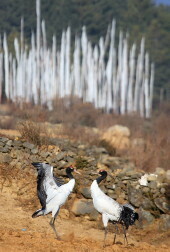 Will modern Koreans, who rarely see cranes and confuse them with commmon urban birds like egrets, remember in time? This painting in the Vijayanagar miniature style by Mr. Kambar, was commissioned especially for the Indian Cranes and Wetlands Working Group (ICWWG) by Sahastrarashmi. 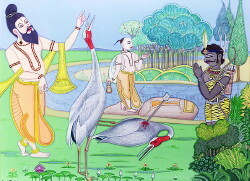 It portrays a key event from the first book of the Ramayana, when a hunter is cursed by the sage Valmiki for killing the male of a devoted Sarus Crane pair. Sarus Cranes are venerated in India, for more see Sundar, KS Gopi and BC Choudhury, ‘The Indian Sarus Crane Grus a. antigone: a literature review.’ J. Ecol. 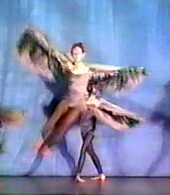 Soc 16 (2003): 16-41. 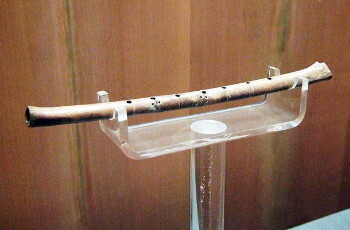 This paper, with others, can be read or downloaded free at Archive.org. 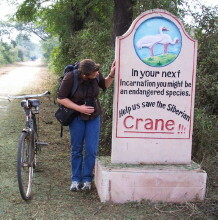 In Keoladeo National Park, an appeal to cultural values seems not to have saved the Siberian Crane. 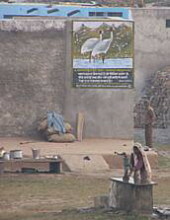 But people in India are joining and promoting all-India Crane Counts and conservation efforts for other crane species, like this village with a Sarus Crane wall mural. Villagers protect five local Sarus Crane pairs and their chicks, from dogs and hunters. Cranes on Parade, a remarkable public art project in Kearney, Nebraska USA. 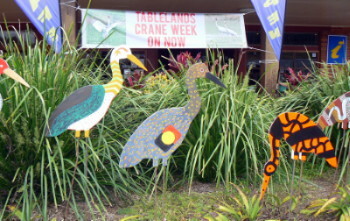 Thumbnails and larger photos of 2m fibreglass cranes painted in many designs by local artists, in this town famous for mass migration of Sandhill Cranes. 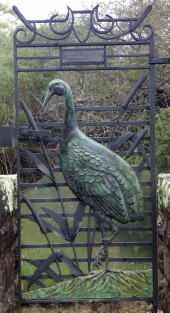 Brolga Gate at Centennial Park, Sydney Australia (K.S. Gopi Sundar). 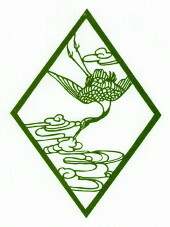 Designed in 1939 to commemorate a leading figure in the Gould League of Bird Lovers.